Wysong dog supplements provide living food elements and a spectrum of nutrients to optimize health. Many modern conventional dog foods are not genetically appropriate, The genetically appropriate diet for all carnivore companion animals is a diet high in meat and fat, and low in starches/carbohydrates. and are devoid of the critically important living food components found in natural, raw foods. Wysong canine supplements add beneficial nutrients back to your pet's food, and restore many vital food components Enzymes and probiotics, and unadulterated, fully composed vitamins & minerals. lost during processing. 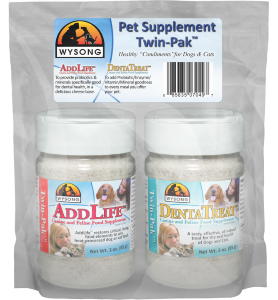 A convenient combination of Wysong Addlife™ and Dentatreat™ supplements for both dogs and cats. Uses natural food sources to provide additional micronutrients, probiotics and enzymes to add value to processed dog foods! A supplement designed for cats and dogs needing assistance in preventing/treating struvite/triple phosphate crystal formation. A supplement designed for cats and dogs needing assistance preventing / treating oxalate, urate or cystine crystal formation. For cats and dogs. Provides beneficial essential fatty acids, including omega-3, -6 and -9. An orally-dosed concentration of probiotic cultures and immunoglobulins for the digestive health of cats and dogs. A supplement for cats and dogs that is designed to balance a fresh meat diet, or Wysong Epigen™ canned diets.